Press the tab and slide to open. 1. Pull up the lever to release the lock. 2. 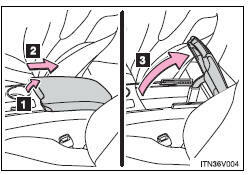 Slide the armrest fully rearward. 3. Lift the armrest to open. If necessary, the console box lid can slide forward. Pull the lid forward while pulling up the lever. 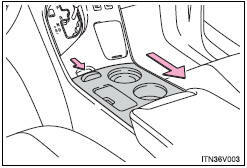 The tray slides forward/backward and can be removed.